Camping is the number one activity in the Chilliwack area. From far and wide, people come to camp at the well known parks and recreation sites. Some campers like to enjoy other activities as well which are close at hand such as hiking, swimming, boating or fishing. See the ‘Camping’ section below for more info. Fisherman flock here from afar to fish in these renowned waters. Year round salmon fishing for all west coast salmon types (Chinook, chum, coho, pink, sockeye & steehead) is available here on the Chilliwack River and Vedder River. 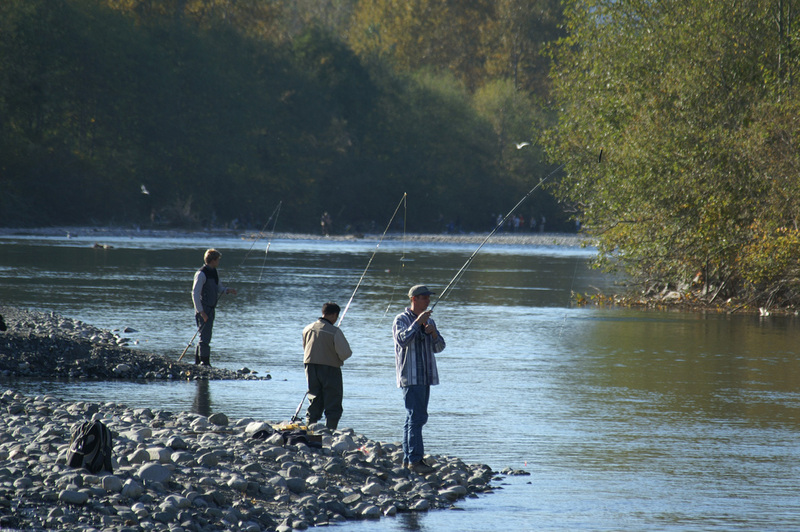 These rivers also host dolly varden, kokanee, mountain whitefish, rainbow trout, sturgeon, sucker and whitefish. Anyone fishing or angling in British Columbia must have an appropriate licenseSign for FRS. Cultus Lake – many fish species including salmon trout and several other species (such as dolly varden, longnose dace, kokanee & chub) although some are considered endangered. Please make sure that you follow the fishing restrictions for this lake. Chilliwack Lake – many salmon and trout types plus several other species such as dolly varden, kokanee, mountain whitefish, sculpin & more. Jones (Wahleach) Lake – cutthroat trout, rainbow trout & stickleback (2 species). Lindeman Lake – brook trout, cutthroat trout, rainbow trout & steelhead. Flora Lake – cutthroat trout & rainbow trout. Greendrop Lake – brook trout & rainbow trout. 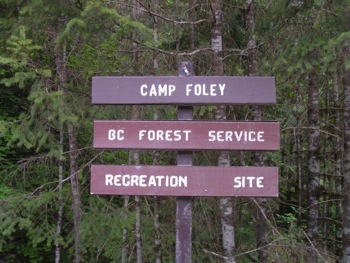 Foley Lake – bull trout (see regulations), coho salmon, dolly varden & rainbow trout. Pierce Lake – kokanee & rainbow trout. The Chilliwack forest service roads (FSR) and decommissioned back roads have made this area a magnet for motorized activities. Many people enjoy simply exploring the many FSRs and back roads while camping nearby – most of these roads require a 2WDHC vehicle but some require a 4WDHC vehicle as shown on the maps. The absence of an accurate Chilliwack back road map has made route finding difficult here in the past but this has all changed now with the new Trail Ventures BC’s recreational maps for Chillwack now available. 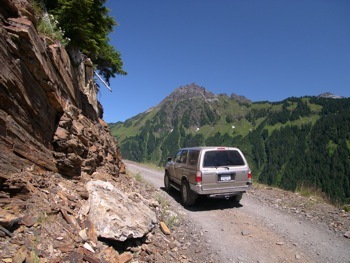 The Vedder Mountain back road and trail network has become predominantly an area for motorized activities such as 4WD, dirtbike and some quad riding. 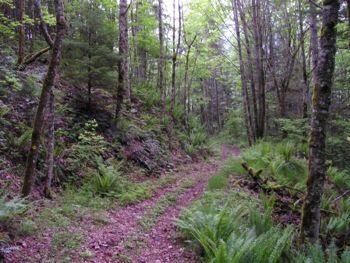 A vast array of trails can be found here connecting to the Vedder Mountain FSR and old spur roads (most are tracks). Some of the trails are for single track activities such as dirtbikes or mountain biking only – watch for signs. Most trails are unmarked (but signage is increasing) and are easily followed due to being well used and maintained. The map shows where these trails connect to the FSR, old roads and tracks. Other landmarks such as gates, footbridges, side creeks and communication towers are shown on the map which help with orientation. The type of trails here are a mix of country style with steep downhill/uphill. The Vedder Mountain Trail Association (VMTA) is involved with trail signage, maintenance, legal status, preservation and more. To find out more about VMTA go to: www.vmta.ca. The Chipmunk Creek area is another hotbed of motorized sport. This area sees a lot of quad use but also some dirtbike usage. Organized races are sometimes held here. These are mostly tracks which vary from gently rolling to very steep. No trail markers and little, if no, maintenance. Some long runs of track which were previously used (especially on the E and NE shoulders of Mt. 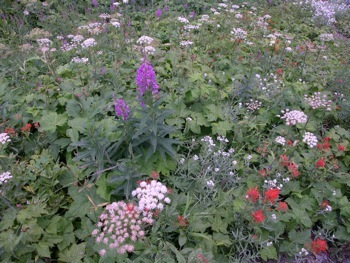 Mercer) have become completely overgrown here. The Mt. Thurston FSR/Chilliwack-Chipmunk Ck corridor is a popular area for all motorized activities. Here, old back roads can be followed along ridges with good views of the Fraser Valley. The map shows the current road/track system used in these areas. The Chilliwack Ck-Tamihi Ck FSR also sees a lot of motorized activity especially along it’s many side roads. Some of these side roads and tracks are quite long giving long rides which can extend quite high into old logging areas. The Lower Chilliwack-Foley Ck FSR area is also very popular with dirtbikes and quads. There are lots of old back roads and tracks here connecting to the Chilliwack-Foley Ck FSR and Chilliwack Lk Rd. Plenty of trailer parking. The first accurate Chilliwack forest service road and back road maps available are Trail Ventures BC’s Chilliwack West Recreational Map & Chilliwack East Recreational Map, which include all of the forest service roads mentioned above and more. There are several excellent Chilliwack hiking trails. 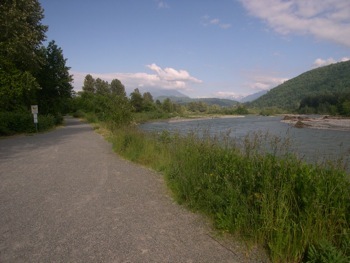 The Chilliwack Trans-Canada Trail (TCT) is one of these which extends from the Vedder River dykes in the W to the Silver-Skagit Rd in the E. Some sections of this trail cross old growth forest, beautiful second growth and follow the banks of the Chilliwack River. The Chilliwack TCT consists of interconnecting sections of single track trail, track, old gravel roads, good gravel roads and paved road. Elk Mountain – Thurston Mountain Trail (aka Elk Mtn Trail & Mt Thurston Trail): one of the more popular dayhikes of all the Chilliwack hiking trails and rightly so. This is Chilliwack’s equivalent of Vancouver’s ‘Grouse Grind’. 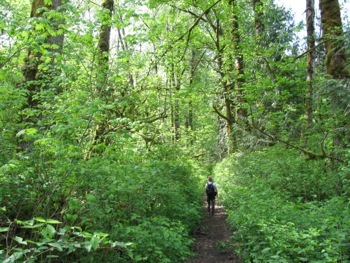 Easy to access, old growth forest, meadows, wildflowers, and ridge walks are some of the attractions. The Elk Mountain ridge trail continues on to Mt. Thurston and Mt. Mercer as well. 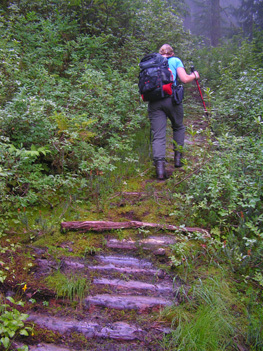 Post Creek – Greendrop Lake Trail (aka Lindeman Lake Trail & Greendrop Lake Trail): one of the most popular Chilliwack hiking trails, partially due to its proximity to the Chilliwack Lake Campground. This full circuit hike includes the Flora Lake Trail. 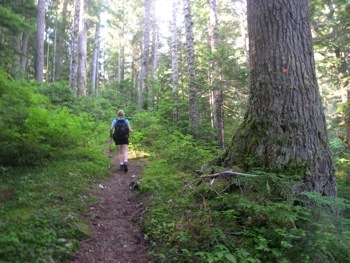 This trail circuit connects 3 scenic lakes: Lindeman Lake, Greendrop Lake and Flora Lake. 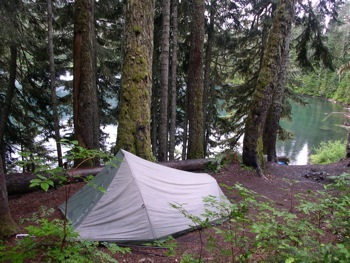 Good backcountry camping at Lindeman Lake campground and Greendrop Lake campsites. Excellent hiking area, although be prepared to negotiate sections of boulder scree. 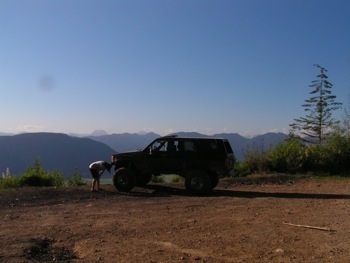 Cheam Peak Trail (aka Mt Cheam Trail): combine an exciting 4WD ride with a sweet hike to the top of one of the highest mountains in the area. 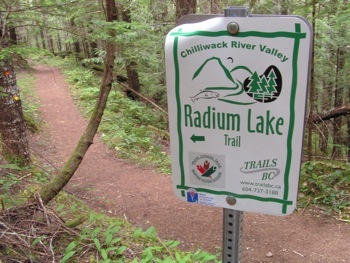 One of the most popular Chilliwack hiking trails. Great alpine meadows and scenery. A relatively short hike. Also gives access to Lady Peak mountaineering route. 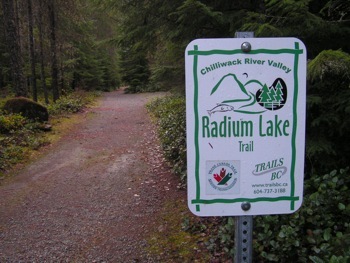 Radium Lake Trail: from the Chilliwack Lake Provincial Park, access can be made to this well used trail which climbs up to ‘Radium Lake’ and further above to Mt. Webb and Mt. MacDonald. Pierce Creek Trail: ascends to Pierce Lake and continues above to lovely ‘Upper Pierce Lake’, Mt. Pierce and Mt. MacFarlane. This trail was likely established by prospector G.O. Pierce searching for gold ~1901. A cabin was also built above Pierce Lake of which old traces remain. Pierce was prospecting for gold, hoping to find a similar discovery to that of the Lone Jack Mine in upper Silesea Creek (Slesse Creek) on the USA side. Reports indicate that Pierce did have some success here but likely not a lot. Slesse Memorial Trail: this popular Chilliwack hiking trail leads to a memorial site below Slesse Mtn built in memory of the plane crash which occurred here in 1956. The trail continues above to the Propellor Cairn. 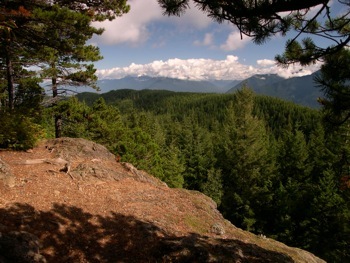 Teapot Hill Trail: a relatively short trail through forest to a low mountaintop with some views. Used year round. 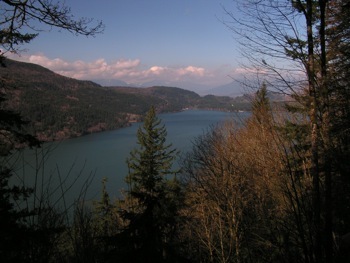 A very popular Cultus Lake hiking trail. International Ridge Trail: this Chilliwack hiking trail provides a nice outing along International Ridge where few people tread. Nice views where the trail ends at Mt. Amadis. Old growth. The longest and the most difficult of the Cultus Lake hiking trails. 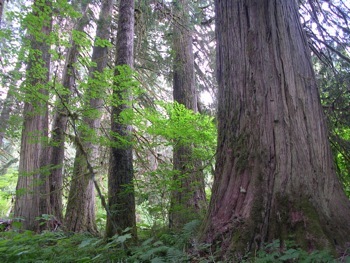 Chilliwack River Ecological Reserve Trail: an easy walk through magnificient old growth S of Chilliwack Lake to the US border. Very impressive. Williams Ridge Trail: a steep trail leading up to Williams Ridge where the trail continues on to a viewpoint W of Williams Peak. 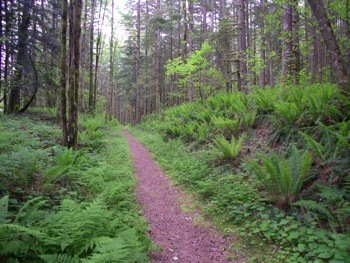 Williamson Lake Trail: a steep sidehilling trail through forest and meadows to lovely Williamson Lk. Mainly used by mountaineers as a base for climbing the peaks above. Lucky Four Mine Trail: a unique well constructed trail from the past which journeys from forest to alpine. A ridge is attained which connects Conway Peak to Foley Peak. Other Chilliwack hiking trails include: Mt. Mercer Trail, Baby Munday Peak Trail, Mt. Laughington Trail, Ford Mtn Trail, Paleface Pass Trail, Post Creek Trail, Liumchen Lake Trail, Cultus Lake Horse Trail, Vedder Peak Trail (aka Vedder Mtn. Trail), Mt. Rexford Trail, Mt. 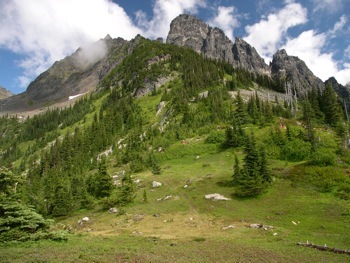 Slesse Trail (aka Slesse Peak Trail), Mt. McGuire Trail, and Mt. Thom Trail. The first accurate Chilliwack hiking trail maps available are Trail Ventures BC’s Chilliwack West Recreational Map & Chilliwack East Recreational Map, which include all of the hiking trails mentioned above and more. 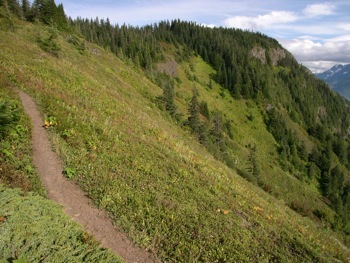 Excellent downhill mountain biking can be found at Vedder Mountain. There are trails here which are designated for mountain biking only. A section of the Chilliwack-Liumchen Ck FSR which is closed to motorized activities makes for a good ride. Also, parts of the TCT are suitable as mountain biking trails. 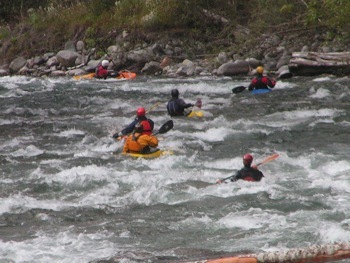 Great rapids along the Chilliwack River make for over 30 km of excellent kayaking, rafting and white water canoeing. 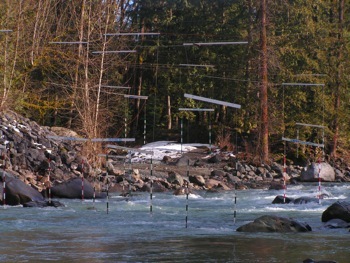 The Chilliwack River is graded from Class II – IV with large rocks, boulder gardens, surfing waves and haystacks. The ‘canyon’ section is faster and more difficult. There is also a kayak slalom course just upstream from Tamihi Bridge. Various put-in and take-out locations can be found throughout the valley – the main locations are shown on the maps. Some tributaries such as Tamihi Ck and Slesse Ck are also run using river kayaks. January-March: low flow. Flow decreases slightly month over month. April: flow starts increasing significantly. May: high flow. Flow continues to increase significantly. Late May to early June: high flow. Flow peaks. June: high flow. Flow decreases significantly. July: flow decreases significantly but still higher than pre-April levels. August: low flow. Flow continues to decrease. Late August-early September: lowest levels of the year (slightly lower than Jan-Mar period). September: low flow. Flow increases slightly. October: low flow. Flow increases slightly. November – December: low flow. Flow stabilizes. Note: the river flow can vary significantly year to year. According to Water Survey of Canada data, maximum water levels have been measured (over the period of 1911 to 2008) to be ~4-8x higher than minimum levels throughout the year. The highest variation tends to occur during the winter months, likely due to particularly heavy rainfall periods which can happen during those months. Also, water flows can vary significantly from day to day, especially in late fall to spring. See Rivers & Creeks of the Skagit Range section (above) for more info on Chilliwack River and its tributaries. www.wsc.ec.gc.ca (input ‘chilliwack’ for station name). 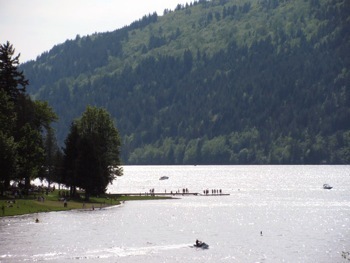 Power boating, water skiing and wake boarding are very popular at Cultus Lake. A few boat launches are located in that area. Power boats can also navigate Vedder Canal and the Fraser River. Chilliwack Lake has a boat launch and does see some boat traffic as well as wind surfing. Small power boats are permitted at Jones Lake. Non-motorized boating and canoeing also take place on Cultus Lake, Jones Lake and Chilliwack Lake. Canoeing is also possible on Foley Lake. 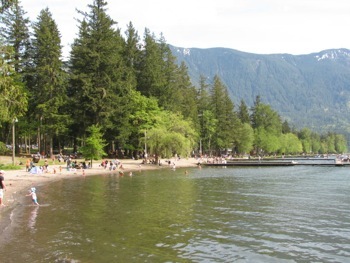 Swimming areas are provided at Cultus Lake, Jones Lake and Chilliwack Lake. 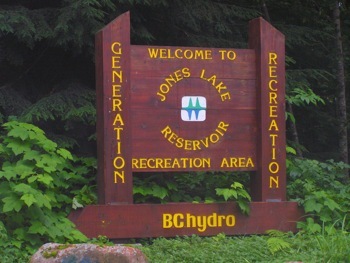 Other swimming holes on hot days include Foley Lake, Chilliwack River (in some places such as Alison Pool), Lindeman Lake, and Greendrop Lake. 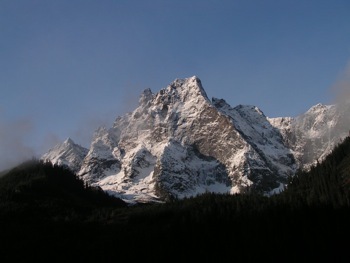 Mountaineering has been a popular activity in the Skagit Range since the late 1800’s. Many locals have spent time over the years bagging peaks within these mountains (which continues to today). Also, well known mountaineers from afar have ventured here to conquer formidable peaks. Mt. Slesse is perhaps the best know example. Once thought to be unclimbable, the main peak was finally ascended by S. Henderson, F. Parkes and M. Winram in 1927. Since that time the incredible NE buttress of Slesse Mtn. has become one of the greatest climbs of its kind in N. America. Roped climbing is mostly conducted here (YDS Class 4-5) although there are some trails and YDS Class 3 scrambling routes in the general area. Cheam Ridge, with its several high peaks, was another area of activity. The first recorded ascent of Mt. Cheam was in 1888 when A. Campbell, E. Knight, P. Sawmill, Mr. Thompson and 2 local native men managed to attain the peak. By 1933, all of the peaks within this ridge were climbed. The types of mountaineering used here are YDS Class 3 scrambling and roped climbing (YDS Class 4-5). 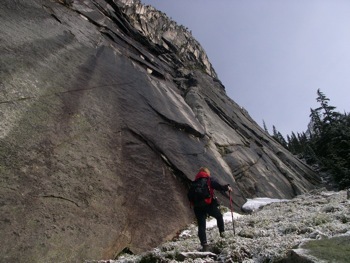 Today, mountaineering remains a popular activity in the Chilliwack area. 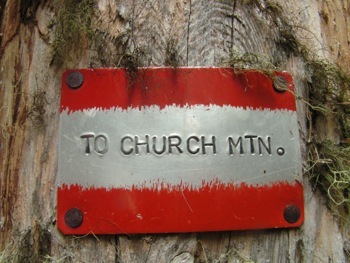 Access to all mountaineering routes is provided by Chilliwack hiking trails (see details above). 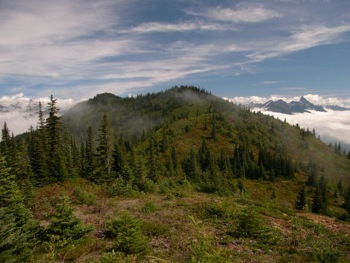 Slesse Mtn., Cheam Ridge, Rexford Group and Illusions Groups are the most popular. However, other areas which also present excellent outings are: ‘Border Peaks’ area, ‘Liumchen Ridge’ area, Mt. McGuire, Mt. Lindeman, Custer Ridge, Mt. Wittenberg, ‘Goat Mtn.’, Williams Peak, Goetz Peak, Paleface Mtn., Mt. Northgraves and Crossover Peak. Several of these peaks have YDS Class 3 scrambling type routes possible. See the Chilliwack East Recreational Map & Chilliwack West Recreational Map for details. The bivouac.com and clubtread.com websites give information, pictures and trip reports for mountaineering routes in the Skagit Range. A well used launch site for paragliding is located near Bridal Falls along the Bridal Falls FSR (see the map for details). 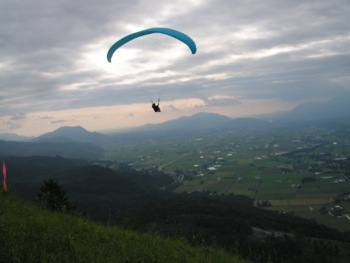 Paragliders launch here and usually land within a grassy field below near the Golf Course near Bridal Falls. A 4WDHC vehicle is needed to access the launch site. The Cultus Lake Horse Trail (and connector trails) near Cultus Lake receives significant horse traffic. 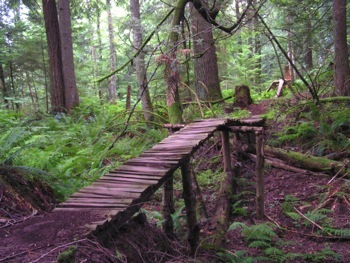 This trail is maintained by the Back Country Horsemen of BC. No biking or motorized vehicles are permitted on these trails, although this sometimes occurs. A large parking area for trailers and vehicles is provided at the Watt Ck Trailhead. Various sections of the Trans-Canada Trail (TCT) are also used occasionally by horseman. No motorized vehicles are permitted on this trail, although this sometimes occurs. Snowmobiling has become a popular activity within parts of the Chilliwack valley over the past 10 years. Most of this activity occurs within the upper Chipmunk Ck backroad system.